On Saturday 25 April morning, a massive 7.9 earthquake hit Nepal with its epicentre not far from Himalayan Learning’s schools. The earthquake was the largest for 80 years in a region that is prone to quakes which have created the Himalaya. The attached photo is a screenshot of the hardest hit area. 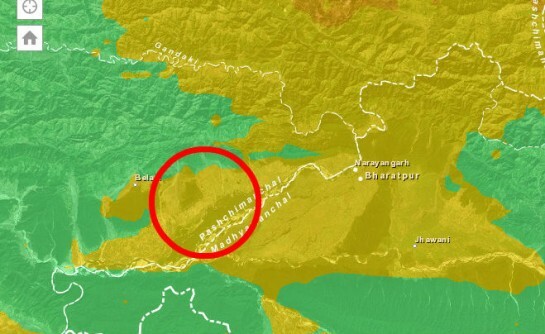 We have circled in red the area that Himalayan Learning primarily works in. Orange is “strong”, green is “moderate”. As can be seen, most of the area we work in was hit by a “strong” earthquake. We predict that the most likely result will be that some of the schools will have either collapsed or be left structurally unsound. The vast majority of children Himalayan Learning supports live in mud and wood houses, where damage will be significant, but at least children are less likely to be injured by heavy concrete or bricks. We are not yet aware of what has happened – whether any schools were hit or children injured. As soon as are aware of whether the 30 schools and over 1,000 children are safe, we will post on the website.